Skerton fighters edged out in national semi-finals. 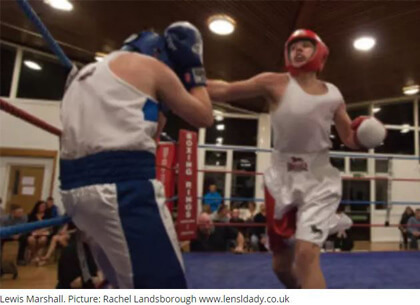 Two Skerton ABC fighters bowed out in the semi-finals of the National Junior Championships on Saturday. Both Shaun Michael Varey and Lewis Marshall lost close split decisions in Sheffield as their bid to be crowned the top fighters in England for their age and weight came up just short. First up in the 60kg category 14-year-old Varey was confident of victory after three hard rounds but didn’t get the decision he was after. 80kg fighter Marshall then appeared to control the opening two rounds before tiring in the third. Skerton again thought their man would get the decision but saw it go against them. In was a happier affair for the club on Friday with six boxers in action on the JR Gym show at Evoque Nightclub in Preston. John Dugdale who put in an excellent three-round display and had his hand raised as a unanimous points winner. Jimmy Mason stepped through the ropes next and he kept his winning run going after a unanimous points victory. Luke Gudgeon was in against a tough opponent from Wigton ABC, putting in a spirited performance as he was unlucky to lose a split decision. Next in was Robert Dugdale who had been out of action for a long period due to injury and his fitness told as he lost a split decision. Sean Coxon completely dominated his Wigton opponent from start to finish with a great display of controlled boxing to gain another unanimous win for the club. Last in for Skerton was Mathew Doey, defending his 64kg North West title for the third time. Doey was in against a tough boxer from Sharpstyle gym in Blackpool but there was no way Doey was relinquishing his belt. All three rounds saw both boxers giving their all but Doey was the stronger fighter and landed the more telling blows and at the final bell he was announced as unanimous points winner as the night ended on a high for the Morecambe-based club.